Bed & Breakfast in the green Umbria, close to Orvieto. 2 double rooms, 2 bathrooms. Low prices! FEET UP Garden House is a natural and peaceful space in Barcelona. At Garden House you will find a friendly, fun and warm atmosphere in a big old house built at the turn of the 20th century. Our Garden house has large sunny bedrooms, a cool lounge and clean bathrooms. It has a big garden with a terrace, another terrace on the roof, a lounge, a guest kitchen and also tv/dvd room. Hilux is located in the beautiful and lively old city of Valencia, the Barrio del Carmen. We have ten spacious rooms, which are all decorated differently by local artists. There is a kitchen, a cosy lounge and a tv/dvd room. 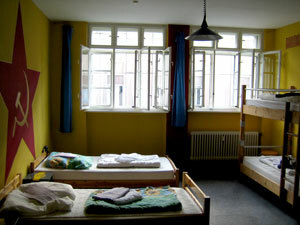 It is a very small hostel, just ten double or twin rooms, all private. The ambiance is very homely and familiar, with great staff and great guests.